Gosh the days are flying by! And with today being Thursday, it's time to announce our Top Pick and HM's for our colour challenge this week. These colours worked beautifully together and we loved seeing the different ways you combined them. 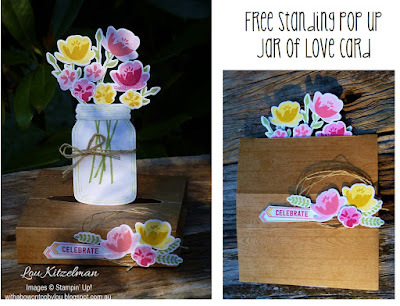 The votes are in and our "Top Pick" for this week is Lou with her lovely "Jar of Love" project. 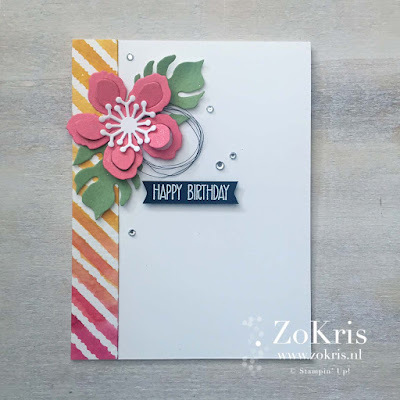 A beautiful bouquet of flowers on a cool pop up card!! What a delightful, cheery, interactive card. Perfect use of the challenge colours. Love these pop up cards - fun to make too!! Brilliant striped background really shows off the challenge colours. Not 1, but 3 using our challenge cards! Absolutely stunning cards. Simple florals combined with gorgeous vibrant water coloured backgrounds are stunning! Such a stunning way to highlight her gorgeous butterfly's! Wonderful focal point and pretty too. I love Jaydee's striking card with that stunning butterfly! 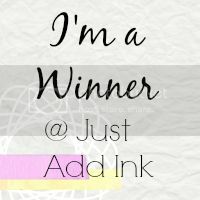 Just Add Ink # 316 Winners!!! Challenge # 316 - Just Add Stripes was a fun Challenge and there are so many ways to incorporate the Stripes into your projects. It was great to see all the cards and techniques that you used. "I love this water coloured underwater scene!" "Emily's water coloured scene is vibrant and packed with delightful details"
"Such a sweet scene and I love the pun with her adoreable mermaids!" "A fun, festive card. That Santa just pops right off the card!" 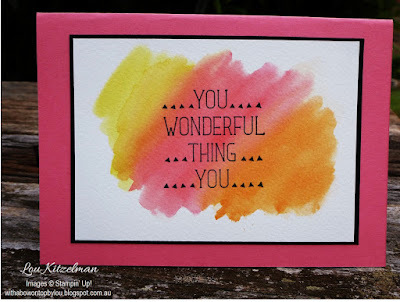 "The bold vertical stripes look fantastic on this awesome CAS card"
"So striking! A lovely clean card that just pops!" 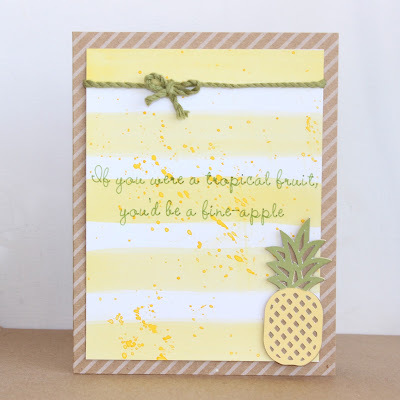 "Love the soft muted tones mixed with the gorgeous pineapple"
"The big stripes are created perfectly with out being to bold"
"Loving the gorgeous wide watercolour stripes and that super cute Pineapple"
Happy Friday to you and welcome to our new challenge at Just Add Ink. to Just add.... Stripes! These could be stripes on designer paper or some stamped or masked ones - we would love to see any way that you would like to use stripes as the focus of your project! Hello there, it's time to announce the winners of our sketch challenge! Thank you to everyone who played along - we really enjoyed seeing all the different ways you interpreted our sketch and brought it to life. But as always we can only have one Top Pick and this week it goes to Emily for this beautiful creation. The vibrant foliage makes this modern stylish card simply stunning. Love the subtle timber & frame teamed with the bright, happy flowers. Absolutely love the clean lines, use of the sketch and those gorgeous pops of colour. 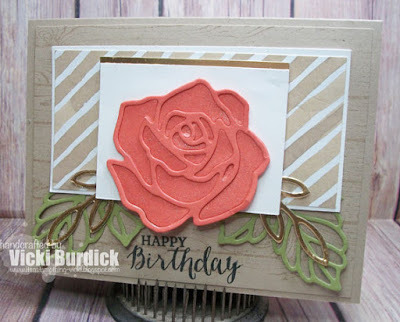 I love the rose as the focal point of her lovely card. Vicki's floral elements worked beautifully together with her warm, soft colours & patterns. Such a lovely combination of dies and colour choices. The touch of gold adds a little pizzazz to a classic card! Great layering effect across the whole card. A beautifully composed card; so neat, and with beautiful use of colour. 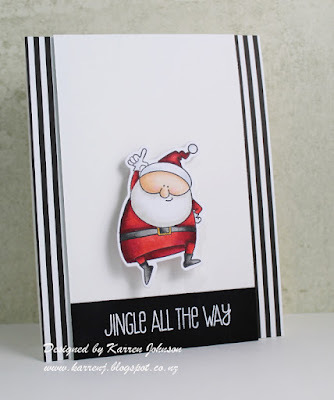 Sue's stamping is perfect - I love the way she's layered this card. 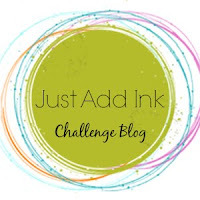 Just Add Ink # 315 - Sketch Challenge! We know you love a Sketch Challenge.....this one has been put together for us by Tina. We can't wait to see what you do with this......Enjoy!! Just Add Ink # 314 - Winners!!! Inspiration challenges give us plenty of scope to express our ideas in so many different ways. We enjoyed seeing all the different ideas and elements that you took from the inspiration pic but there was one entry that really caught the DT's attention. "Wow - what a beautiful art piece taking centre stage on this card! I just love all the colours and details"
"Wonderful exotic vintage vibe to this beautifully coloured image and card"
"Just wow! I love the how striking those flowers are against all that white!" "I love her design and teamed with her cute mice fun sentiment is totally adorable"
"So vibrant and cute! Lovely details and super sweet fruity images"
"Such cute little images and a very sweet sentiment"
"A striking use of watercolour and the black accents are perfect"
"Wonderful background watercolour that lets the sentiment stand out"